NASA's Quiet Supersonic Transport (QueSST) aircraft design is moving on to its next phase after passing a preliminary design review. NASA's Quiet Supersonic Transport (QueSST) aircraft passed a preliminary design review last week, marking a major milestone for the agency's experimental X-plane concept. NASA has been developing new designs for supersonic aircraft, with a specific focus on reducing the strength of the sonic booms — the sound created by a shock wave from an aircraft that moves faster than the speed of sound. The shape and overall design of a supersonic plane is particularly important for minimizing the loudness of the boom during flight. QueSST is the preliminary design stage of NASA's Low Boom Flight Demonstration (LBFD) experimental airplane, also known as an X-plane. So far, a scale model of QueSST has been tested in an 8-by-6-foot supersonic wind tunnel at NASA's Glenn Research Center in Cleveland. The next phase will be to test the technologies in flight, Coen said in the video. "So to do that, we're building an X-plane design and the eventual Low Boom Flight Demonstration aircraft that represents the boom of a larger airplane," Coen added. "The idea is to prove the technology; show how robust it is in a variety of atmospheric conditions, but ultimately to prove that the sound that is created is acceptable to people on the ground." Last week, QueSST was reviewed by NASA engineers, as well as experts from the Lockheed Martin Corp. — the lead contractor NASA partnered with in February 2016 to create the initial design of the supersonic aircraft. The teams concluded that "the QueSST design is capable of fulfilling the LBFD aircraft's mission objectives, which are to fly at supersonic speeds — 1.4 times the speed of sound — but create a soft 'thump' instead of the disruptive sonic boom associated with supersonic flight today," according to a statement from NASA. Completing the initial review of the design's operational effectiveness is a major milestone in NASA's initiative to make supersonic passenger jet travel over land possible. This also means that NASA can begin the process to collecting proposals and awarding a contract to build a piloted LBFD X-plane, and then possibly start flight testing as early as 2021, according to the statement. 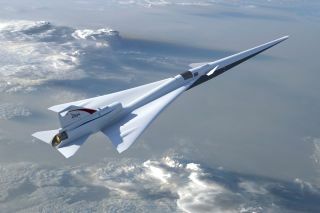 "Managing a project like this is all about moving from one milestone to the next," David Richwine, manager for the preliminary design effort under NASA's Commercial Supersonic Technology Project, said in the statement. "Our strong partnership with Lockheed Martin helped get us to this point. We're now one step closer to building an actual X-plane." For the next phase of testing, pilots will fly the LBFD X-plane over communities to collect data, including details about the atmosphere so that engineers can better understand the effect the atmosphere has on the sonic boom. Most important, researchers will conduct ground measurements and surveys of the population to better understand the level of disturbance caused by the supersonic, albeit quieter, aircraft. Those measurements are necessary for regulators to allow supersonic flight over land in the U.S. and elsewhere in the world, according to the video. "It should sound like a thump, so it could be that people don't even notice the sonic boom … and that's really the data that we are talking about for regulatory change," Richwine said in the video. NASA will work with Lockheed Martin to wrap up the preliminary design and aerodynamics of the QueSST experimental aircraft over the next few months. Acquiring the LBFD X-plane contract will be "fully open and competitive," agency officials said in the statement.